Wagner was a feature of Stokowski's concerts and particularly of his recordings, from the Rienzi Overture recording of 1919 featured here until his November 1974 recordings of Siegfried's Rhine Journey and the Act 3: Funeral Music and Immolation Scene from Die Götterdämmerung (also for Victor). Many of Stokowski’s acoustic efforts to record Wagner were unsuccessful. In fact, their first effort to record the Tannhäuser Overture was in May, 1919 at the time of this successful Rienzi Overture recording. 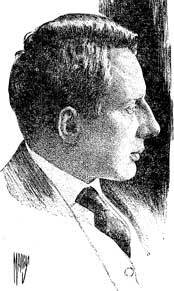 Stokowski recorded seven takes of the Tannhäuser Overture on 5, 7, 8 and 9 May 1919 in the Camden Church Studio 4. So that these two works of Wagner were among the first dozen of Stokowski's efforts to record the Philadelphia Orchestra with the acoustic process. The first successful Wagner recording by Stokowski and the Philadelphia Orchestra was also their first recording of a work over more than one side. 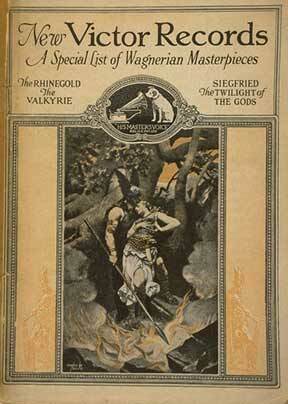 This was the Overture to Wagner's early opera Rienzi, recorded on Thursday May 8, 1919. This was the third take of the Overture, with two previous attempts on May 6, 1919. The recording was first issued on two 12 inch (30 cm) Victor Red Seal single sided disks 74602 and 74603, matrix numbers C-22815-3 and C-22816-3. At this time, Victor did not release Red Seal recordings on double sided disks but it was later reissued as a two sided 12 inch (30 cm) Red Seal disc Victor 6239. In Europe, Victor's partner the Gramophone Company issued the recording on Gramophone 3-0520 and 3-0521 and later on Gramophone DB-382 two sides. During 1919, Stokowski and Victor Talking Machine Company recording engineers experimented with a reduced orchestra, this time made up of 10 violins, 4 violas, 4 cellos, 4 double basses, 3 flutes, 3 oboes, 2 clarinets, 2 bassoons, 4 horns, 2 trumpets, 3 trombones, 2 tubas (to reinforce the bass), 1 harp, and 2 percussion. This is a spirited and generally fine sounding recording, remarkable for 1919. However the impact of the electrical recording process in permitting 1920 audiences to experience the full impact of Wagner's orchestra may be heard by clicking the link below. This gives a contrast of this 1919 acoustic recording with Stokowski's 1926 recording, made in the Academy of Music with the new Westrex electrical recording system. as fine as the 1919 recording was for its period and the technical limitations, it is but a pale image of what we can hear from the 1926 performance. The Rienzi Overture was a featured work throughout Stokowski's career, included not only in his third season in Cincinnati, but also during his first season in Philadelphia in 1912. In fact, the Rienzi overture was one of Stokowski's most played works in Philadelphia during this period, featured in every season from 1912 through 1924, excepting only 1913 and 1922. His love of this music shines through his several great recordings of this work. Even given the ancient acoustic of this 1919 recording, it continues to give a profound vision of this famous early Wagner work. 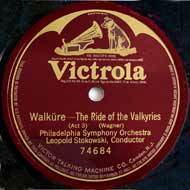 1921 - Wagner - Die Walküre - "Ride of the Valkyries"
The "Ride of the Valkyries" from the beginning of Act III of Die Walküre was recorded by Stokowski and the Philadelphia Orchestra on March 25, 1921 in Camden. They had previously attempted, unsuccessfully, to record this work in the May, 1920 sessions which produced the Liszt Hungarian Rhapsody and Dvorak New World Symphony largo recordings. This music in standard performance usually takes between 5:30 and 6:00 minutes, so this side is necessarily heavily cut, although the performance is brisk and fleet. The Ride of the Walkeries was issued on a 12 inch Victor Red Seal record, Victor 74684, matrix C-24987-4. 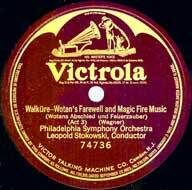 Also from Die Walküre in 1921 Stokowski was successful in recording Wotan's Farewell and Magic Fire Music from the conclusion of Act 3. This music must have been particularly difficult to record in the acoustic process. The beginning brass instrumentation was ideal for acoustic reproduction, but the later high strings and flute music was at the edge of the acoustic frequency range. In fact this music was difficult to record, as witnessed by the fact that it took 12 takes in this recording session to produce a satisfactory disk. Of course, this is also a heavily cut version of this music. Cuts were normal in the acoustic era to fit music on the 4 minute record sides, but this performance is cut far more than is usual. Music usually taking between eight to sixteen minutes in concert (depending on where you begin) has been cut down to one 4 minute 78 RPM side. The performance is noble and broad and captures the full spirit of this dramatic end of Act 3 of Die Walküre, when Wotan places Brünnhilde into a deep sleep and surrounds her with fire. This is the Magic Fire that will deter all but the bravest hero from penetrating the ring. Wotan then departs in sorrow. Imagine the impact of this recording in the 1920s on virtually all who would hear it - people for whom access to any opera performance, let alone the rare and difficult staging of an opera such as Die Walküre would require a trip of many hundreds of miles. Victor Red Seal 12 inch disk 74736, matrix number C-24124-12 was recorded December 5, 1921. 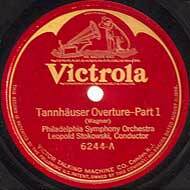 Stokowski and the Philadelphians finally produced a successful Tannhauser Overture recording, after the unsuccessful May, 1919 and March, 1921 sessions. This was on November 7, 1921 in the Camden Church studio sessions. This recording was of the original Dresden version of the Overture, which preceded the revisions of the Paris version. This recording was issued in August, 1922 on three 12 inch Victor Red Seal discs, Victor 74758, 74759, and 74768 (matrix numbers C-22808-10, C-22814-7, C-24999-2). In Britain, the recording was issued by the Gramophone Company on disks DB 286 and DB 387. Three disks were just barely sufficient to record the complete Dresden version of the overture, which takes more than 14 minutes to play. 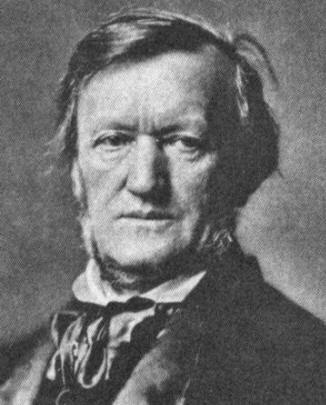 Most previous versions were only on two sides, and were therefore far less successful in capturing the Wagner scoring. It is interesting to contrast Stokowski and the Philadelphians in 1921 with the very early 1907 recording by Carlo Sabajno and the La Scala Orchestra on two Gramophone single sided disks, 050540 and 050541, of which 050540 is reproduced below. Yet, this Sabajno recording is a surprisingly noble interpretation, given the limits of recordings made by this very early technology. Another successful Tannhäuser recording from Stokowski's acoustic legacy was the Festival March from Act 2, Scene IV of the opera. The introduction to this scene is the march in which the knights, the ladies and the invited guests enter the grand hall of the Landgraf. Berlioz wrote of this music "...[the music] assumes a style that is knightly, proud, strong. We are certain, without seeing the performance of this scene, that such music accompanies the movement of men who are valiant, strong, and equipped in shining armor..." 3. Stokowski and the Philadelphia Orchestra recorded this Festmarsch during three sessions: December 3, 1923, April 19, 1924 and April 28, 1924. The interpretation of Stokowski made April 28, 1924 in their sixth 'take' fully realizes this description of Berlioz. Victor published the recording as Victor Red Seal 6478, matrix C-29051-6 coupled with the Wagner Tannhäuser Overture. 42 musicians were used in this recording, including bass saxophone, contrabassoon, and two tubas to substitute for the string basses and timpani. One of the amazing Stokowski - Philadelphia Orchestra recordings of the acoustic era is the 1924 Prelude of Act 1 of Lohengrin. Considering the orchestral delicacy of this Prelude, it would seem beyond the scope of the acoustic technology. The quiet, fluttering high strings which are a feature of this music alone would seem beyond the acoustic span. Yet, even though Stokowski found it necessary to reinforce the high violin strings with flutes and piccolos, the result is idiomatic and compelling. This recording not was issued until 1925 on a double-faced Victor 12 inch Red Seal disk 6490 matrices C 30021-2 and C 30022-1. Listen to this beautiful recording by clicking on the link, below. 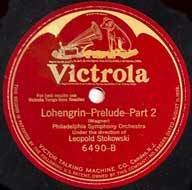 As was decribed in the page 1917-1924 Stokowski - Philadelphia Acoustic Recordings, only about 16% of the acoustic recordings Leopold Stokowski made with the Philadelphia Orchestra were successful enough to be released. With Wagner, as with other composers, the unsuccessful acoustic recordings were many. In both November and December, 1922 in Camden, Stokowski and the Philadelphia Orchestra tried unsuccessfully to record the finale of Götterdämmerung. Interestingly, this is the same music as Stokowski’s final Wagner recording in November, 1974 with the London Symphony Orchestra (although of course the acoustic side would have been heavily cut). This had followed equally unsuccessful recordings of the Lohengrin Prelude Act I in April, 1922. In May, 1923, Stokowski and the Philadelphia Orchestra attempted the Transformation Music from Parsifal, which is the theme of Parsifal's arrival at the Holy Grail from the end of Act 1. This is music of such delicacy that it is not surprising that the result was judged unsatisfactory. This is a loss, since Stokowski did not record this Parsifal Act 1 music later, commercially, although the same theme occurs in Act 3, which he did record. Speaking of the Parsifal Transformation Music, there is a fine performance of this music by Fritz Reiner and the Philadelphia Orchestra from 1931. This was captured by the Bell Laboratories experimental recordings (described in Leopold Stokowski, Dr. Harvey Fletcher and the Bell Laboratories Experimental Recordings) captured live from a November 28, 1931 concert. Given this early recording date, this is the earliest surviving Fritz Reiner recording yet issued. The performance is included in the Philadelphia Orchestra - The Centennial Collection Historic Broadcasts and Recordings 1917 - 1998 issued by the Philadelphia Orchestra. The Wagner which Stokowski did successfully record acoustically remains for me both successful and moving, as living performances, and not just curiosities from a distant past. Have a listen to them. In these recordings, the sound is particularly successful for acoustic recording, and except for touches such as the tuba doubling of the base line, this might at first not be so evident as being an acoustic recording. The topping out of the frequency spectrum at about 2,400 Hz is not particularly noticeable, especially in these beautiful Rienzi and Ride of the Valkyries renderings. This is also a tribute to the Victor technicians, since the treble response range can easily be lost in coating the wax with carbon, the further processing of the master disk, the production of stampers, etc. Finally, I should add that these Wagner recordings from the acoustic era are all, in my mind, both noble and inspiring, making one forget the vintage and the faded image of times long past. The style of the rubato of the performances and portamento of the strings seems particularly evocative of not only that era of the early decades if the twentieth century, but perhaps also evocative of performance practice of Wagner’s time. The Philadelphia Orchestra of that time was heavily German in origin and training. Also, Stokowski and his wife Olga Samaroff spent May to August between 1911 and 1914 at their villa in Munich, where they were immersed in the very active Bavarian musical scene. Perhaps it is not too much of a stretch to believe that both Stokowski and his orchestra were well familiar with German performance traditions, including perhaps back to the 1870s and 1880s. A remembrance of things past. 4 Discography of American Historical Recordings - Victor matrix C-22808. Tannhäuser Overture. Accessed 2015 http://adp.library.ucsb.edu/index.php/matrix/detail/700007963/C-22808-Tannhuser_Overture.